Is your wireless network not performing as it should? 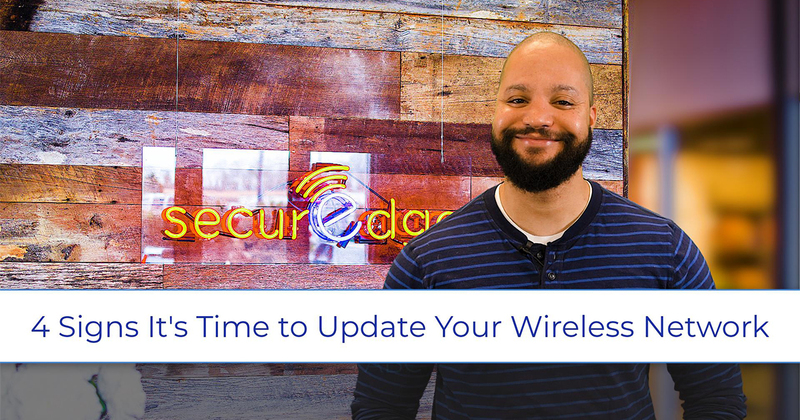 In this vlog, Kevin explains why a network refresh or update may be in order when it comes to your Wi-Fi performance. The wireless planning and installation phases are critical for a optimized Wi-Fi network. When it comes to large scale wireless networks, they can be both complex and expensive, so how do you know when it’s time for a network refresh? Basically, does your current wireless network support your requirements? You wouldn’t attempt to drive a car from point A to point B if you knew that it was unreliable or unsafe for the road, so why risk an outdated wireless infrastructure that underperforms or endangers the security of business-critical information and data. 1. It’s been more than three to four years since your last network refresh. Devices and applications change so rapidly that a wireless network needs to be designed and managed with the future in mind. Wi-Fi infrastructure components evolve such as access points, switches, controllers, firewalls, as well as, software like network access control. Service from SecurEdge ensures that you have the latest equipment and all the components that go with it. Wireless LAN design best practices evolve as well. Just like the infrastructure components of your network, wireless LAN design advances just as fast. For example, it used to be the standard to focus your design on coverage only, today we know that you need to focus on both capacity and coverage which has completely changed how we approach wireless LAN design by adding context into the equation. SecurEdge begins this process by performing a wireless assessment, which allows us to take a deeper look into your network to figure out the overall health and operational quality of your current wireless system. 2. Has your wireless network design been optimized for mobile devices? This is important because the rapid increase in the use of mobile devices across every industry has no signs of slowing down. Smartphones, laptops, tablets, wearables and the like, experience pretty short refresh cycles of twelve to eighteen months before the new models hit store shelves. Is your network ready for the upcoming wave of devices? 3. How about your applications? Do they run as they should? Just like mobile devices, when you know which applications are running on your wireless network, your wireless LAN design can be optimized for their requirements. SecurEdge validates this process by running application performance testing which analyzes your network from the perspective of the devices and applications that are actually running on your system. 4. End-users are frustrated with slow speeds and unreliable connectivity. Obviously, a typical sign that something is wrong are the feelings and attitudes of your end-users. Business and society rely on Wi-Fi so much that not having it can cause some seriously upset people. SecurEdge Networks has been helping businesses refresh and update their wireless systems for over a decade. It’s our industry specific knowledge and experience that you can count on to design, deploy, and manage your wireless network from beginning to end. Previous Post: Why Should Your Business Offer a Captive Portal to Your Guests? Next Post: 5 Ways IoT is Transforming Hospitality: Is Your Network Ready for the Future?